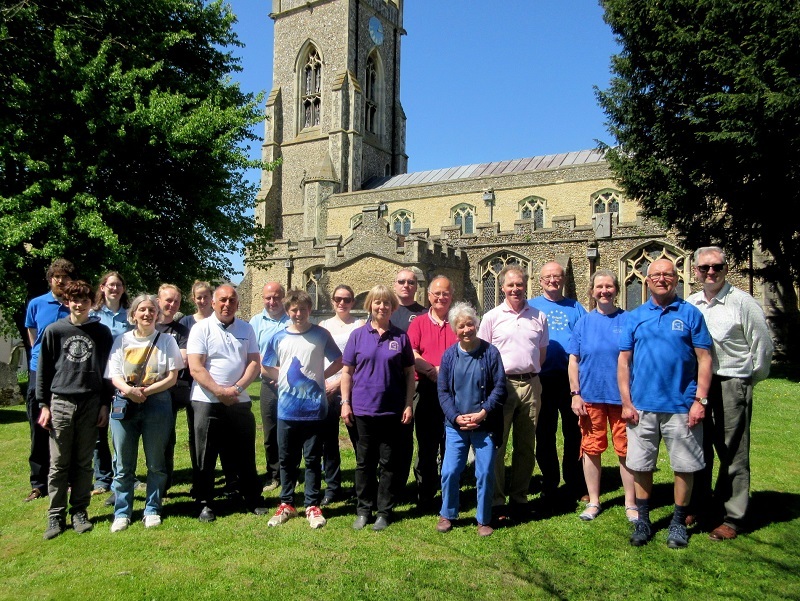 Left to Right: Ron Burgess, Colin Taylor, Simon King, Charlotte Furneaux, Ailsa Reid, Jane Burgess, Michael Haynes, Adrian Gray, Mons Setje Eilers, Benjamin Poole, Peter Bridle, Hugh Deam, Alison Merryweather-Clarke, Mark Sadler, Victoria Sadler, Judy Kirby, David Parks & Susan King. Stedman Triples, Grandsire Triples, Plain Bob Triples & Cambridge Minor. 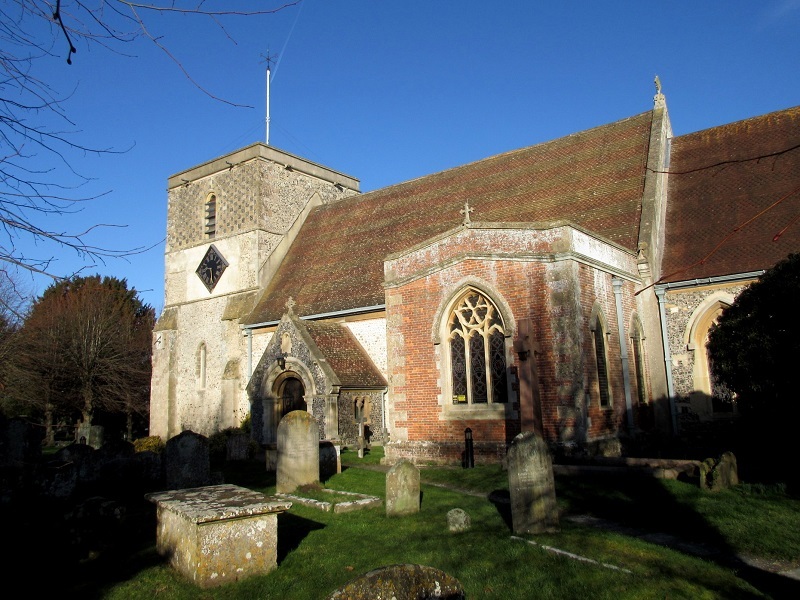 Bucklebury was documented in the Domesday Book as Burgeldeburie (stronghold of a woman called Burghild) and was already part of a Royal Manor belonging to Edward the Confessor before the Norman invasion. Henry I granted the settlement to Reading Abbey and it remained under their administration until 1540. The Georgian mansion of Bucklebury Manor dates to 1830 and is situated on the manorial estate, having come to international notice in recent years due to its ownership by the Middleton family, Kate Middleton now being the Duchess of Cambridge. 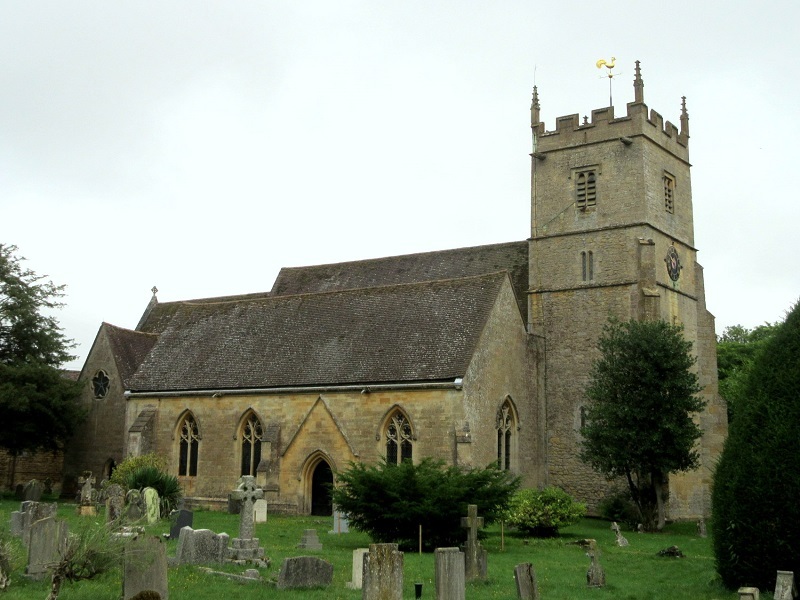 The parish church is early Norman, with the north chancel added a century later, and the chancel during the 18th century. 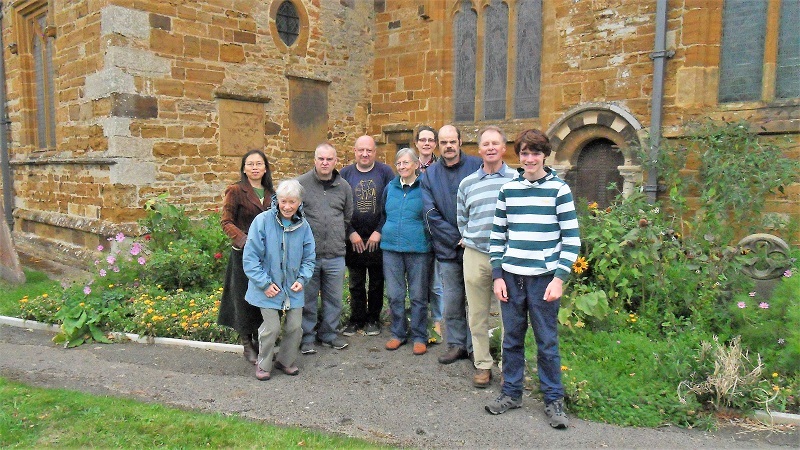 Left to Right: Kathy Xu, Judy Kirby, John Hearn, Hugh Deam, Jane Hedges, Donna Bennett, Michael Haynes, Colin Taylor & Benjamin Poole. Harpole was documented as Harpol (a dirty or muddy pond) in the Domesday Survey of 1086. Given its proximity to Northampton, then it is not unexpected that evidence of extensive Roman habitation has been unearthed around the village. 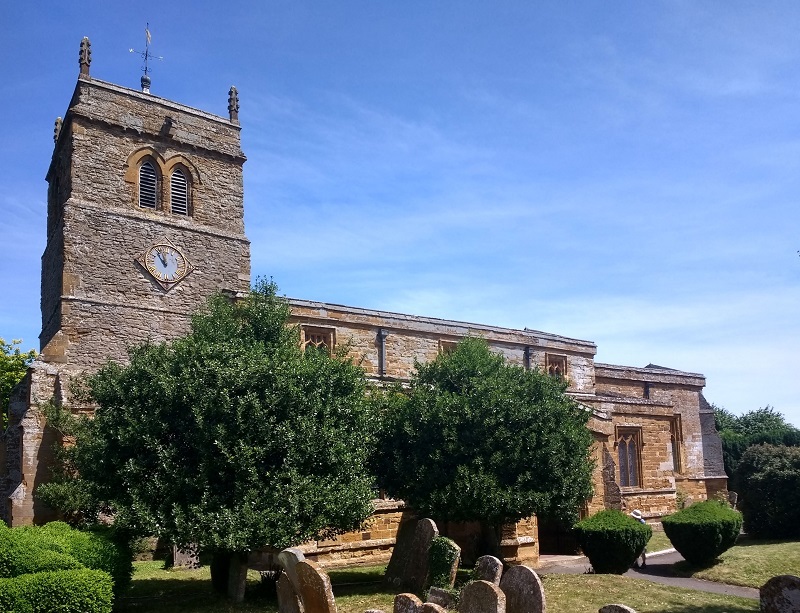 Harpole was one of the first villages in the country to organize a Scarecrow Festival Weekend back in 1997 and this still takes place every September, with a share of the proceeds across the years having provided for ongoing maintenance of the parish church. As with many of the churches in the county the Transitional period example here is constructed of local ironstone. The Norman font is one of the finest surviving examples in a country church, with carvings depicting two dragons eating a plant motif from left and right, and another dragon surrounded by foliage seemingly biting its own tail. The tower is from the Early English period, with all of the bells cast at Taylor’s foundry in Loughborough, the back five bells being from 1930 and treble from 1995. Bugbrooke derives from the Anglo Saxon description (Buchebroc) for the brook belonging to Bucca. A prehistoric track passed through land here, and this was followed by a Drovers Way. The village is situated on the A5 (Watling Street) which was the Roman Road that connected Dover with Chester. In more recent centuries other key transport routeways have been constructed through the parish, namely the London North Western Railway (originally London and Birmingham Railway) and the Grand Union Canal (originally Grand Junction Canal). Bugbrooke Marina is a popular mooring for narrowboats on the canal. 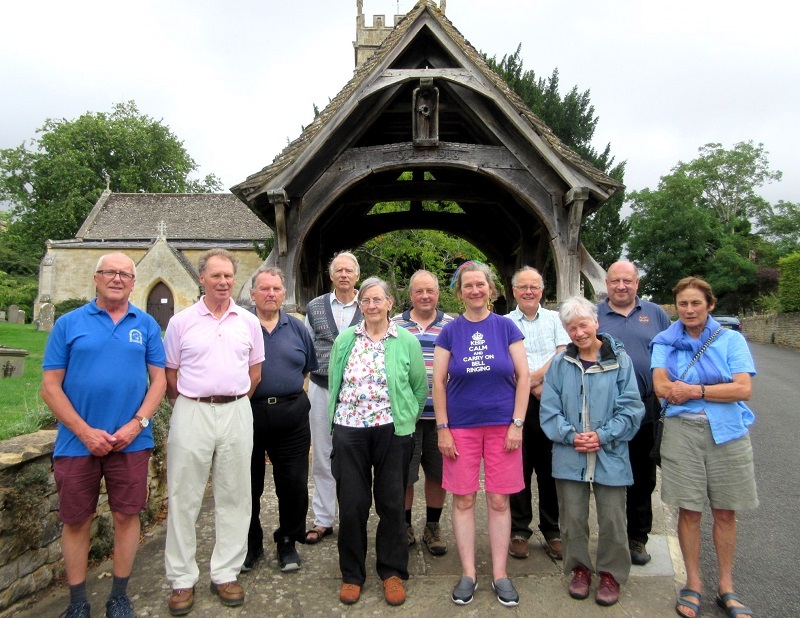 Left to Right: Paul Lucas, Colin Taylor, David Parks, Simon King, Jane Hedges, Ron Harphan, Alison Merryweather-Clarke, Michael Probert, Judy Kirby, Hugh Deam & Susan King. Cambridge, Single Oxford, St Clements, Little Bob, Stedman & Grandsire. Kemerton was documented as Cynebergingctun (farmstead of a woman called Cyneburg) in the Domesday Book (1086). The settlement was divided into two manors from Plantagenet times (1154 - 1485), hence the two manor houses here, Kemerton Court and Upper Court. 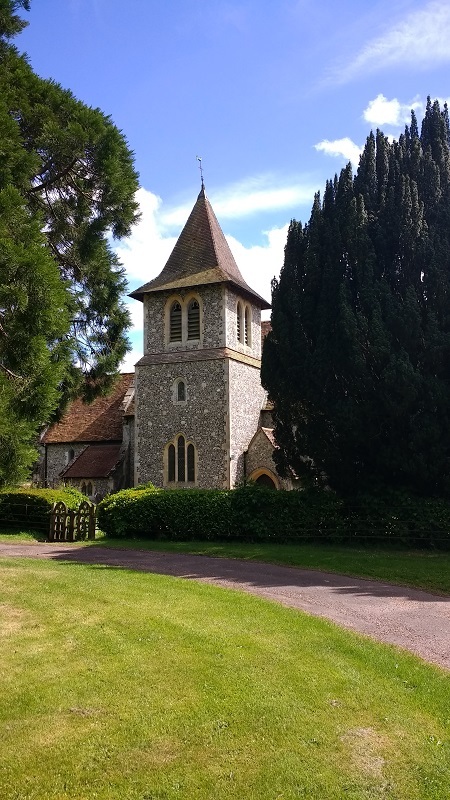 One of the best kept secrets in the county is to be found directly across the road from the church, the “Walled Garden” being a two mile walkway within a monastery style garden that passes close to Kemerton Lake. Although the garden lies within Kemerton Court, admission is free, with voluntary donations payable in a box at the church. The Decorated style church that stands today is a rebuilding of 1840, the original Norman building having been ordered by Tewkesbury Abbey. The 14th century tower was restored in 1879. All bar one of the bells were cast by Abel Rudhall Gloucester, 1754. The exception is the second, cast by Thomas Mears, Whitechapel, 1844. Overbury (Anglo Saxon description for an upper fortification) is a quintessential estate village, although the original Elizabethan manor house burned down in 1738 and was rebuilt by John Martin, of the noted banking family, who had bought the estate in 1723 from the owners of Kemerton Court. Today the Overbury Estate is a diverse enterprise that encompasses housing in the village and nearby Conderton, with the replacement Georgian manor house and its grounds being the base for numerous small business enterprises. 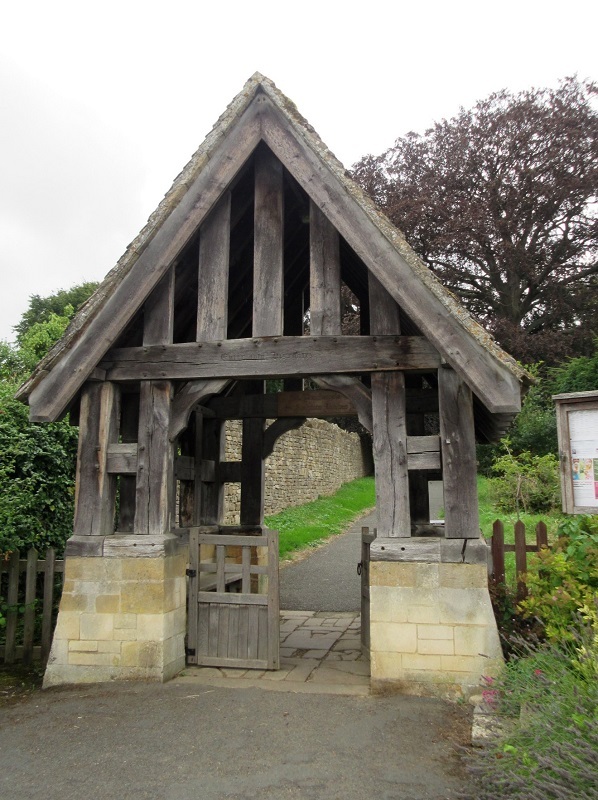 The church, which stands adjacent to the estate office entrance, is Norman in its origins, with the churchyard entered through a particularly impressive lychgate. The earliest of the bells is the fourth, 1480, Robert Hendley, Gloucester. Third, 1599, Newcombe, Leicester. Second & Tenor, 1641, Roger Purdue, Bristol. Fifth, 1718, Abraham II Rudhall, Gloucester. Treble, 1903, Taylor, Loughborough. Ashton under Hill is situated between the Cotswolds and the Vale of Evesham and exemplifies the photogenic qualities of both, with numerous elegant 17th century thatched cottages and red-brick Georgian cottages. As the toponym suggests the settlement was once notable for its abundance of ash trees, being in the shadow of Bredon Hill. For many generations Ashton was celebrated for its orchards and market gardening. 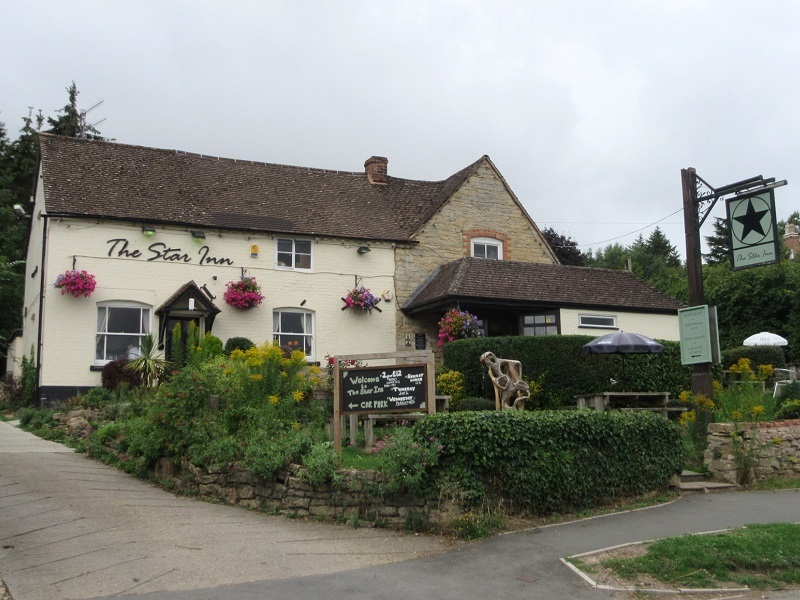 Only one pub remains in the village – The Star Inn – but it is one of the most highly rated in the county and we enjoyed an excellent lunch here. 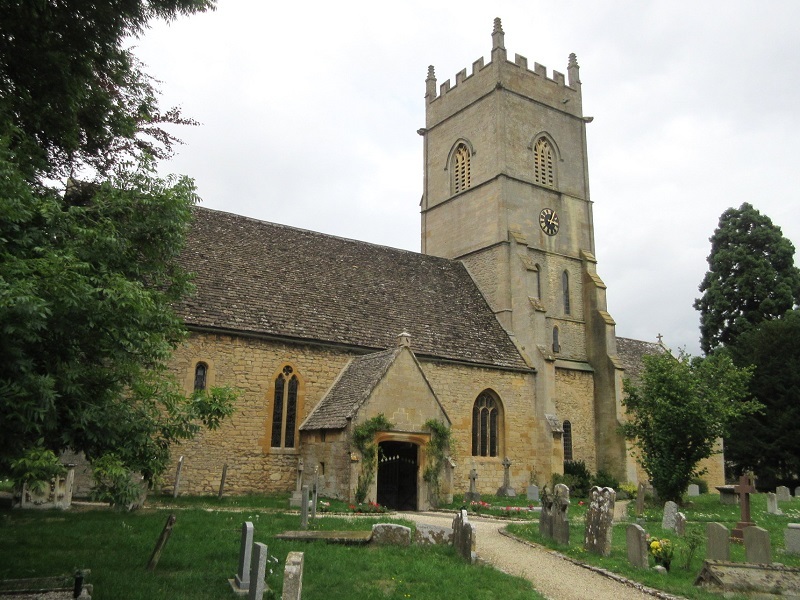 The Norman parish church has been reconstructed and extended across the centuries, with the chancel rebuilt in 1624. 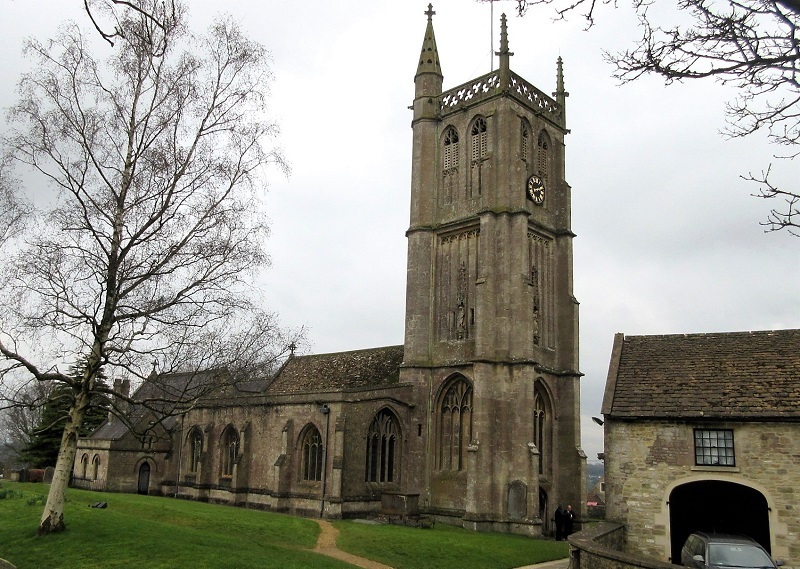 The 14th century pinnacle tower contains six bells, four of which (2, 3, 5 & tenor) date to 1785, cast by Charles & John Rudhall of Gloucester. Fourth, 1827, John Rudhall. The treble was added in 1946 by Gillett & Johnston. The small ringing chamber is bedecked with Christmas decorations all year round due to the tradition of a new item being added every Yuletide. 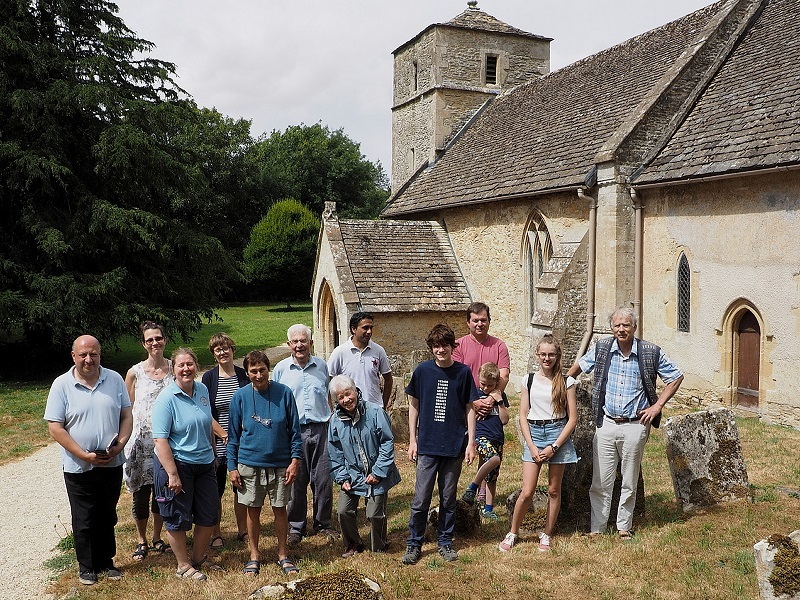 Left to Right: Hugh Deam, Donna Bennett, Janice Beale, Mary Carroll, Susan King, John Beale, Judy Kirby, Pralhad, Benjamin Poole, Jonathan Beale, Christopher Beale, Judith Godfrey & Simon King. Not pictured: Michael Haynes. 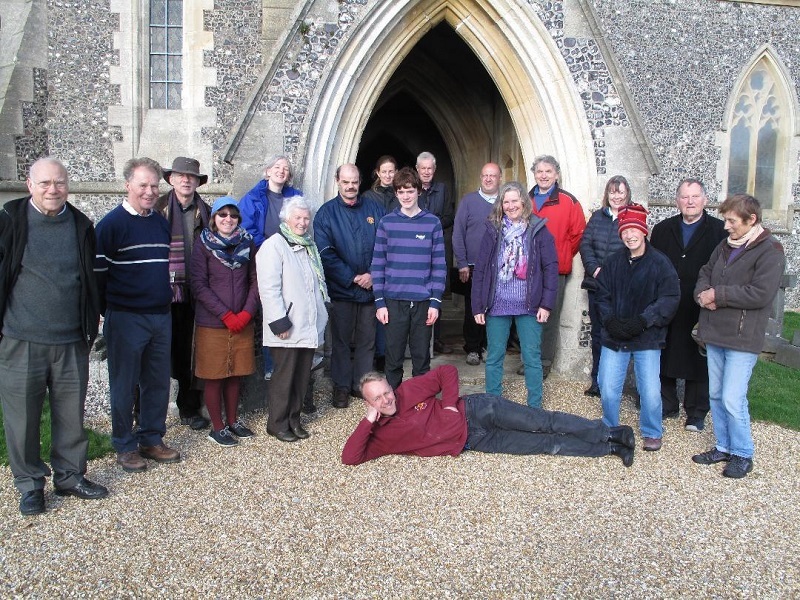 Left to Right: James Scott Brown, Benjamin Poole, Rachel Croft, Ailsa Reid, Adrian Gray, Mona Setje-Eilers, David Jennings, Hugh Deam, David Mead, Katy Routh, Clare Fairbairn, Mike Lelkes, Michael Probert, Judy Kirby, Colin Taylor, John Pusey, Alison Merryweather-Clarke, Paul Lucas & Neil Ephgrave. 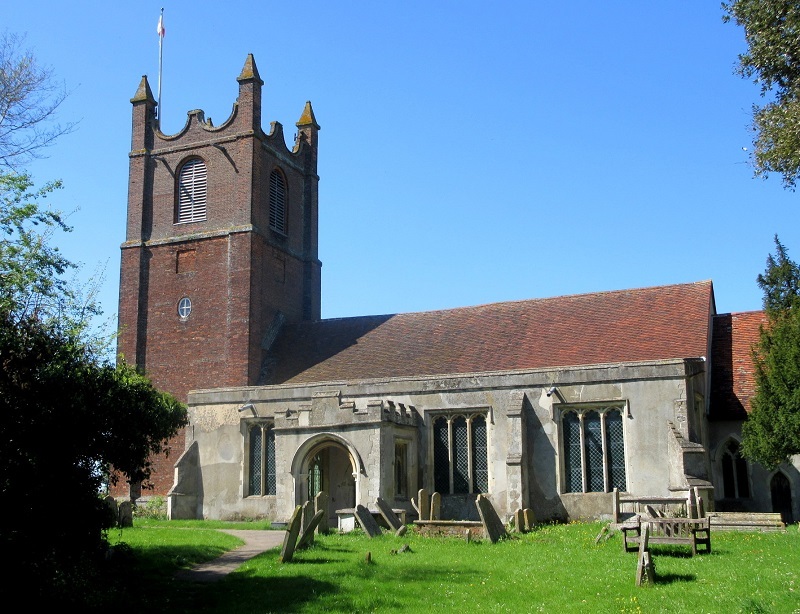 Coggeshall was granted market town status in 1256, having been a settlement of strategic importance since Roman occupation, the road known as Stane Street being from that time. The representation on the village sign amply captures the early history of Coggeshall, depicting a Cistercian monk farming sheep near the abbey and a weaver working at a loom. 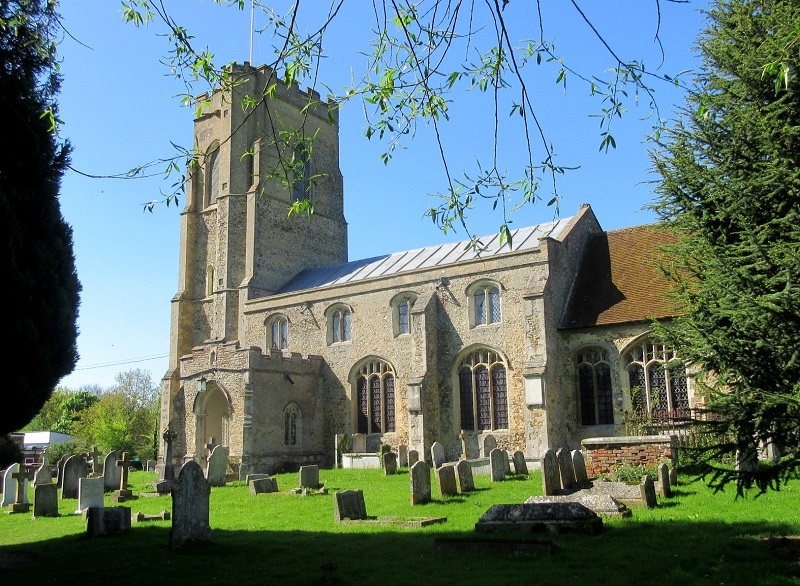 The large 15th century parish church is built on the site of its Norman predecessor, with the tower being 72ft in height. The earliest bell is the fifth, Miles Graye III, 1681, Colchester. Sixth and eighth, 1733, Thomas Gardner, Sudbury. Second, 1876, John Warner. Fourth, 1931, Gillett & Johnston. The other bells all by Taylors of Loughborough (7 -1904, 10 – 1929, 1,3,9 – 2000). Greenstead Green was first documented as Grenstede (pasture used for grazing) in the 10th century. 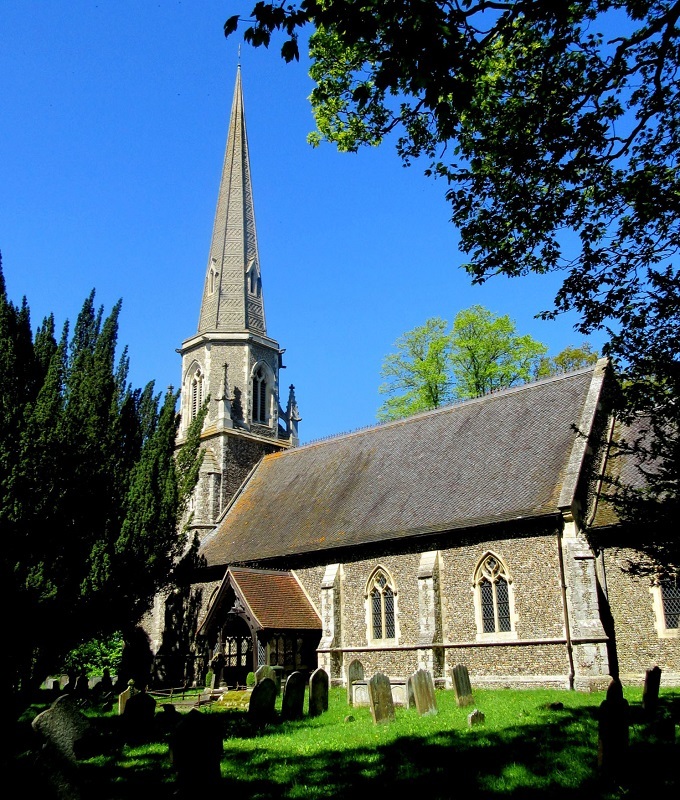 The church is Victorian (1845), built in the Decorated style, being to the designs of George Gilbert Scott, with the west tower capped by a commanding spire. The bell-chamber is octagonal, with the bells hung counter-clockwise and arranged quirkily with the third rope situated almost directly behind the fourth. All of the bells date to 1845, cast at Whitechapel by Charles & George Mears. 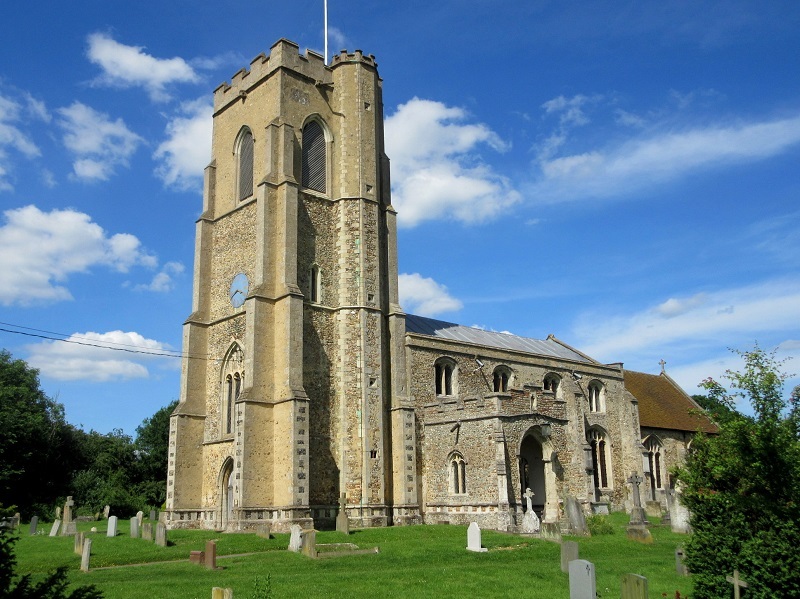 Halstead is situated on a high ground overlooking the River Colne, with its name denoting a hillside place of shelter. The area was settled during the Iron Age, with later Roman occupation. 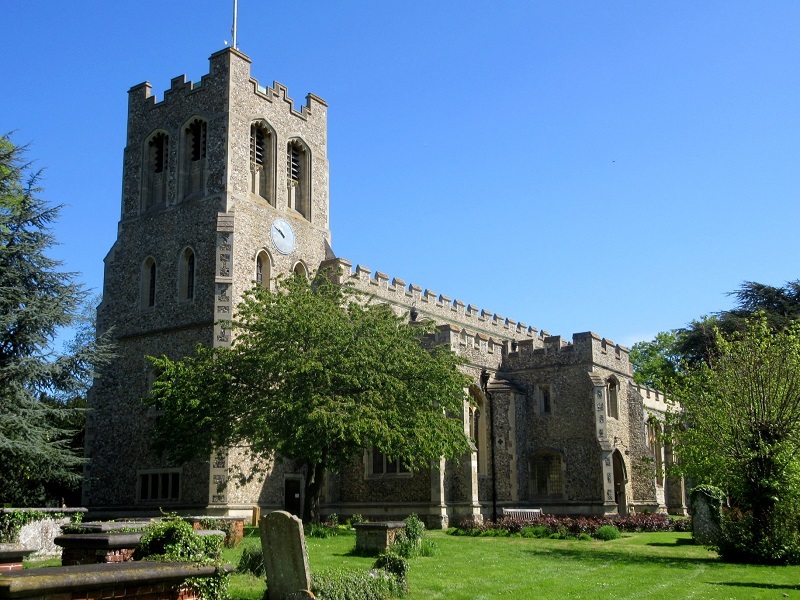 Halstead received its Royal charter as a market town in 1251. The predominant source of employment in the town was long associated with the wool trade, in particular weaving of cloth, silk and crepe. During the Second World War, one of the largest P.O.W. Camps was located here, housing over 500 Italian and German soldiers. 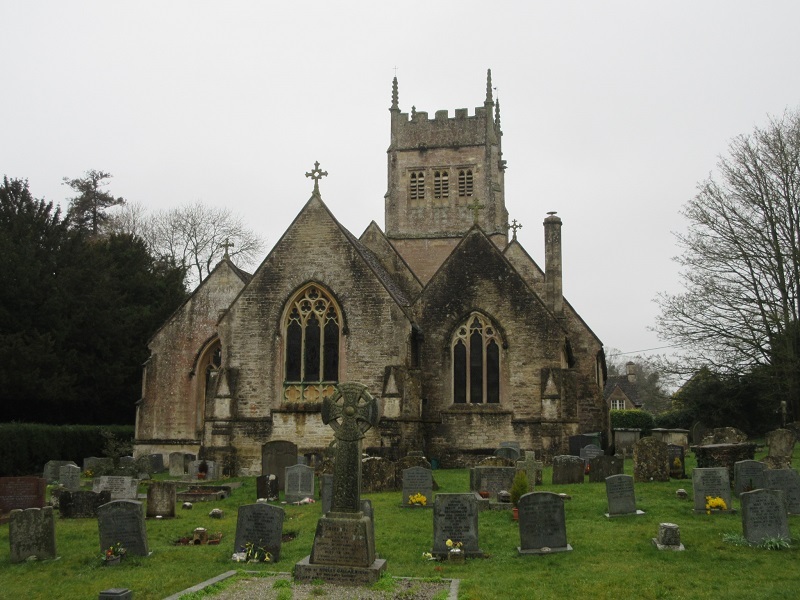 A church has stood here since the reign of King John in the 12th century. 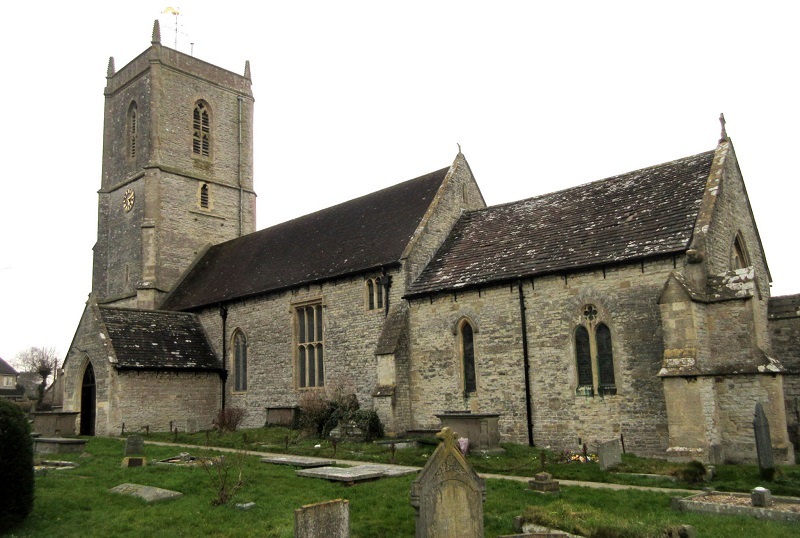 The present building is primarily 14th century (nave, chancel and aisles). All bar one of the bells were cast in 1957 at Taylor’s Loughborough foundry, the exception being the seventh which is a particularly early bell, cast in 1410 by John Bird at a foundry in London. Toppesfield See Saturday 11th July 2015 for details. Ridgewell See Saturday 3rd June 2017 for details. Haverhill is situated within a dip of the chalky hills known as the Newmarket Ridge, and derives its name from Hjamer (anglicised to Haver), the son of probably the most famed Viking warrior Ragner, who led a scavenging incursion into the area around 850 AD. 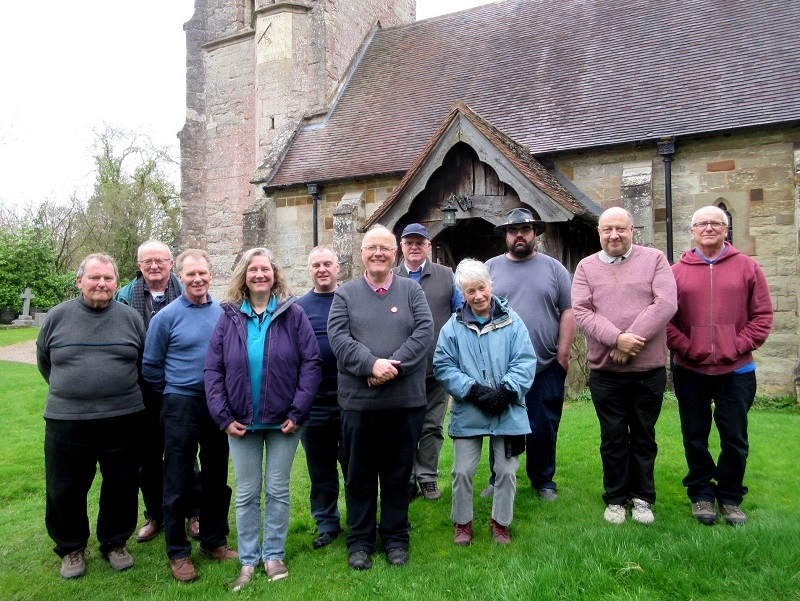 Left to Right: David Parks, John Pusey, Colin Taylor, Alison Merryweather-Clarke, John Hearn, Michael Probert, Graham Cane, Judy Kirby, Harry Cane, Hugh Deam & Paul Lucas. Not in Photo: Simon King & Susan King. Yorkshire Major, Cambridge Major, Kent Treble Bob Major, Little Bob Major, Plain Bob Major, Stedman Triples, Grandsire Triples, Double Oxford Minor & St Clements Minor. Shirley see Saturday 9th April 1988 for details. 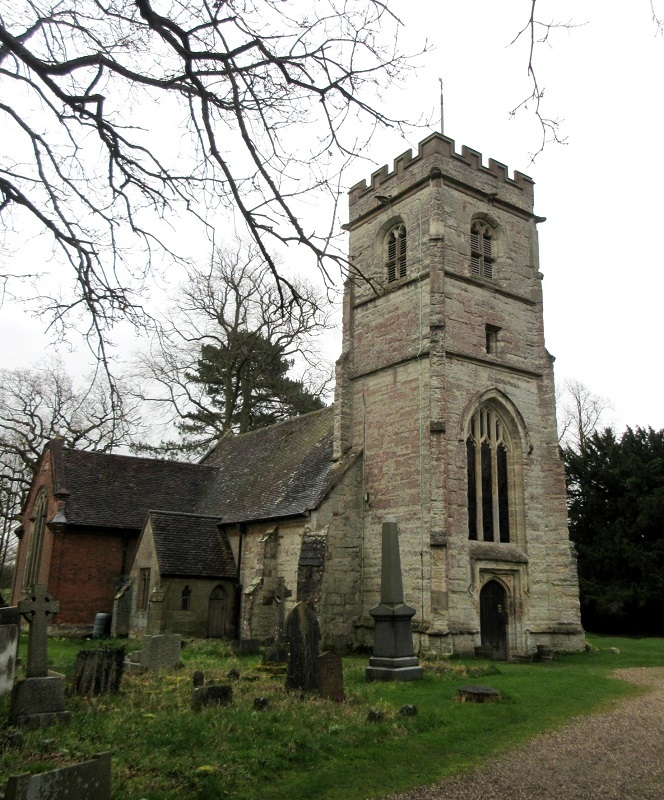 Lapworth was first documented as Hlappawurthin (Hlappa’s estate) in 816 AD, with a later notation in the Domesday Book as Lapeforde. 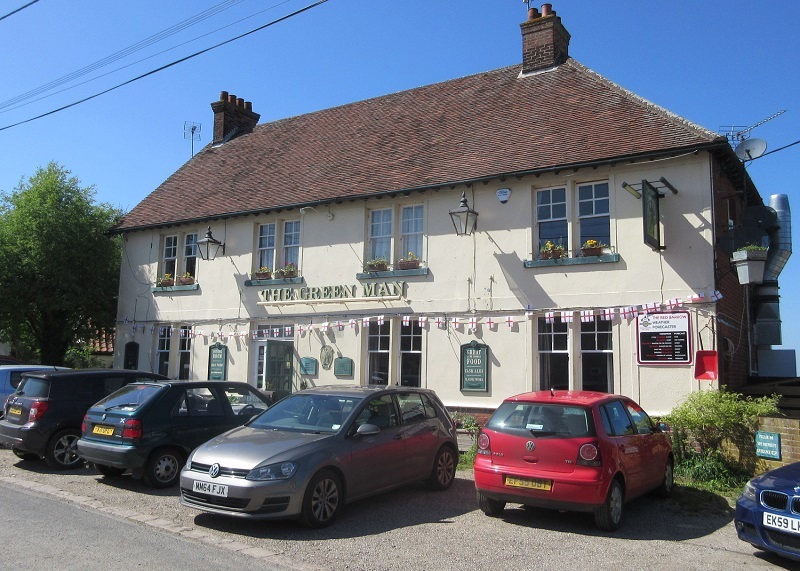 The village is still relatively rural, but its population is now firmly commuter focused rather than farming based, its location being at the junction of the Stratford Canal and the Grand Union Canal. The emblem on the village sign as you enter Lapworth depicts a narrow-boat passing through the lock here. The 13th century church has an interior primarily reflecting the remodelling of the 15th century. 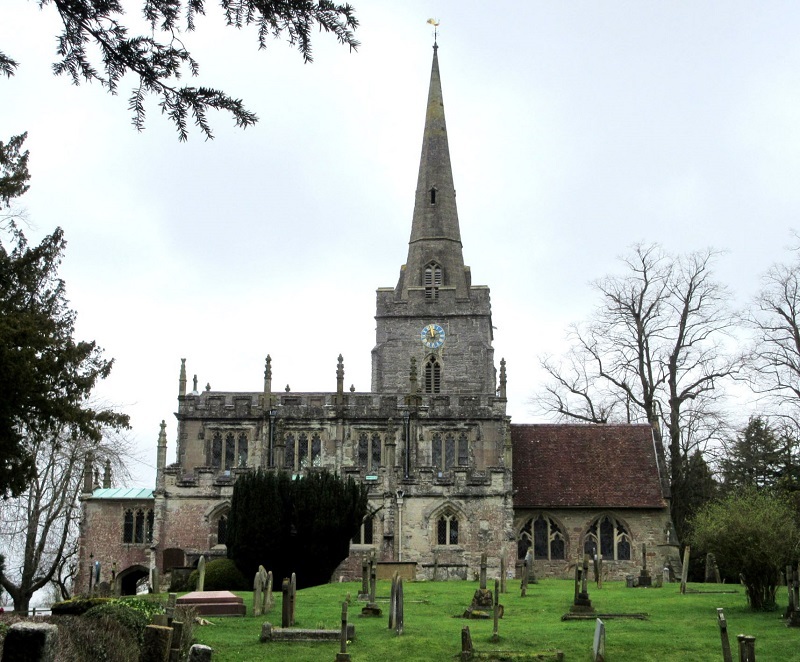 The two-stage north tower is from the 14th century and has an octagonal spire which was added several centuries later. 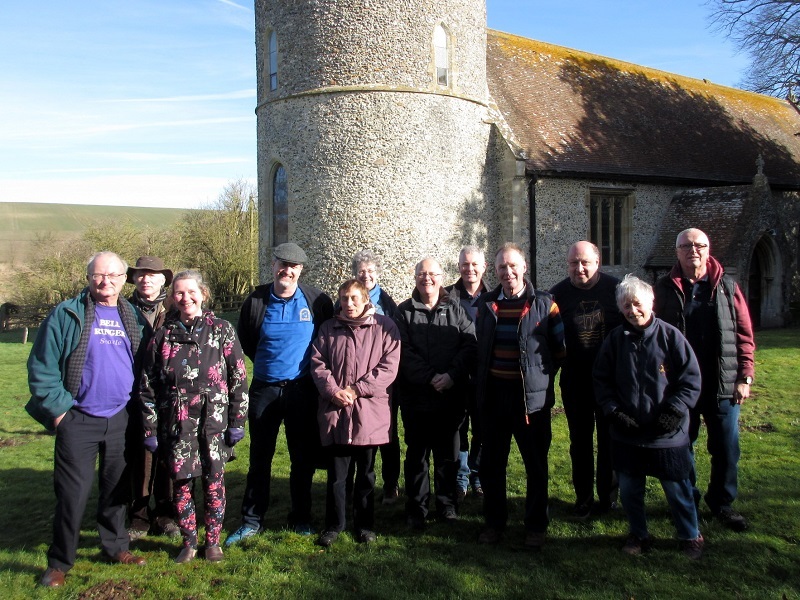 Left to Right: Hugh Deam, Adrian Nash, Simon King, Susan King, Alan Bainbridge, John Hearn, Sally Wale, Elizabeth Mullett, Shanie Nash, Michael Haynes, Alison Merryweather-Clarke, Michael Probert, Donna Bennett, Judy Kirby, Mary Carroll, Jane Hedges, Colin Taylor & Paul Lucas. Little Bob Major, Plain Bob Major, Stedman Triples, Grandsire Triples, Cambridge Minor & Double Oxford Minor. Grittleton was documented in the 1086 Domesday Survey as Greitelintone (Grytel’s Estate). Gauze Brook, a tributary of the River Avon, flows west to east across the village and the Fosse Way passes through the northern edge of the parish. Grittleton House is a large Victorian country house, with lodges and stables, which is now a corporate venue. 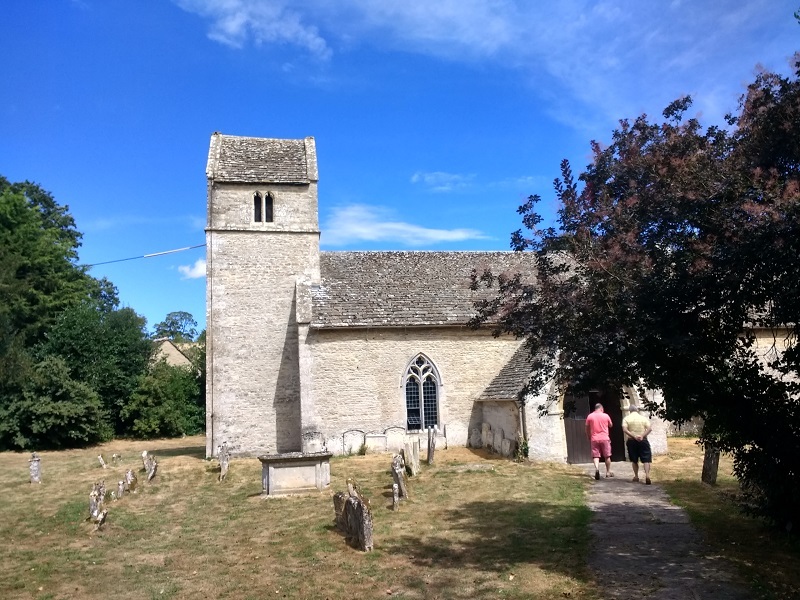 The parish church is situated across the road from the manor house and dates to circa 1200, with a restoration by AW Blomfield (1865 – 67) which was paid for by the owner of Grittleton House, Sir Joseph Neeld. The highlight of the interior is a capacious four-bay north arcade, plus there is the Neeld family pew. The three stage tower is from the 15th century, with the two earliest bells (4 & 6) dating to around 1480, both cast at a foundry in Bristol. Second, 1718, Abraham II Rudhall (Gloucester). Other three bells by Mears & Stainbank, fifth from 1872, treble and third, 1906. Nettleton also includes the hamlets of Horsedown, Nettleton Shrub and West Kington Wick, deriving its name from a farmstead at the place overgrown with nettles. 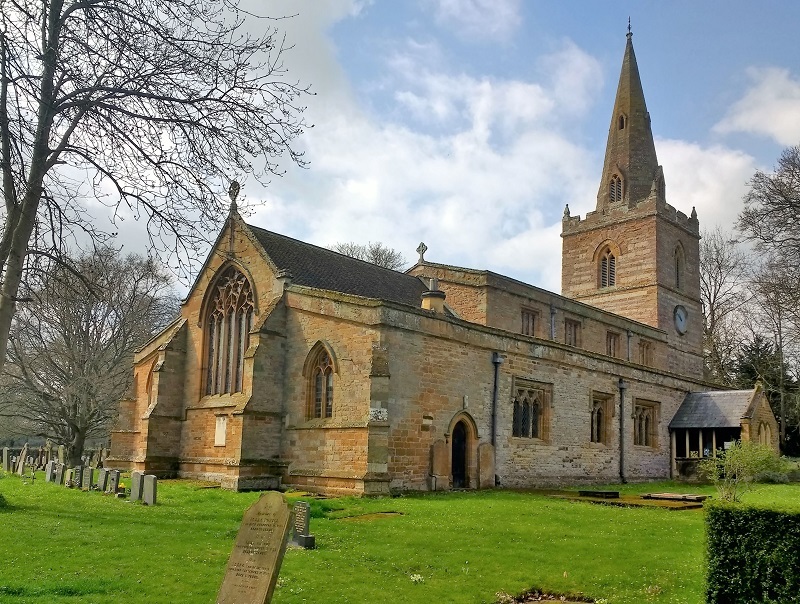 The late 13th century parish church is actually located in Burton, the parishes having been separate until 1934. The interior furnishing of the church gives evidence as to its manorial connections, with the Georgian box pews perhaps most notable. The earliest bell is the sixth, dating to 1410, cast at a foundry in Worcester and rare in that its inscriptions are bordered by foliage similar to that found on the medieval bells of Hereford Cathedral. Fourth (1652) & Fifth (1653) both by William III Purdue (Closworth). Second, 1754, Abel Rudhall (Gloucester). Third, 1830, Thomas II Mears, Whitechapel. Treble, 1889, LLewellins & James (Bristol). 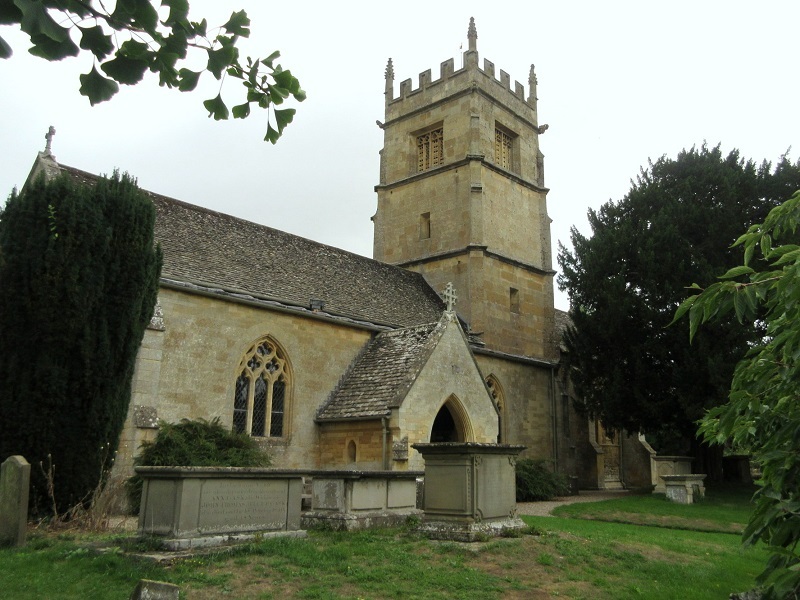 Colerne derives its name from the Anglo Saxon description for a building where charcoal is made or stored. This large, but somewhat isolated village has an elevated position overlooking the Box Valley and is known to locals as “the village on the hill”. From the 14th century until late in the 19th century the manor here was held by New College, Oxford. 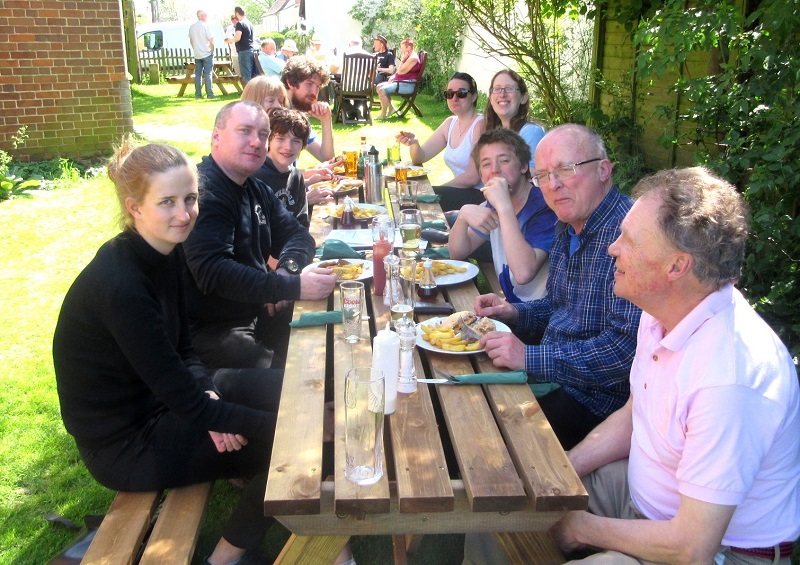 Our lunchtime venue was the Fox & Hounds pub, a converted 18th century blacksmiths, where meals are incredibly low priced and portions immensely generous, making this a real stand out hostelry. 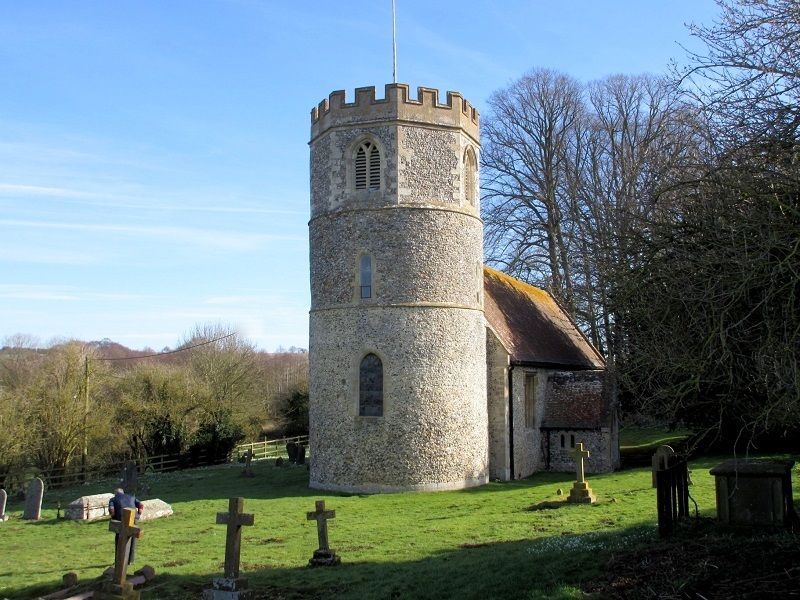 The large 15th century church was heavily restored in the 19th century and possesses a mighty 15th century tower that can be seen from several miles away. The earliest bell is the tenor, cast at a foundry in Worcester, 1410. Fourth & Fifth, 1652/53, William III Purdue (Closworth). Second, 1754, Abel Rudhall (Gloucester). Third, 1830, Thomas II Mears, Whitechapel. Treble, 1889, Llewellins & James (Bristol). Marshfield derives its name from having been settled by the Anglo Saxons and its character is exemplified by a wealth of Georgian housing, such as the Toll House, extensive stable ranges and alms-houses, with the wool trade and malting having contributed to much of the prosperity. Marshfield is one of the few places where Mummers’ Plays are still performed every Christmas, with the Market Place being the starting point at 11.00am on Boxing Day, and a solo church bell chimed to announce the arrival of the seven mummers. 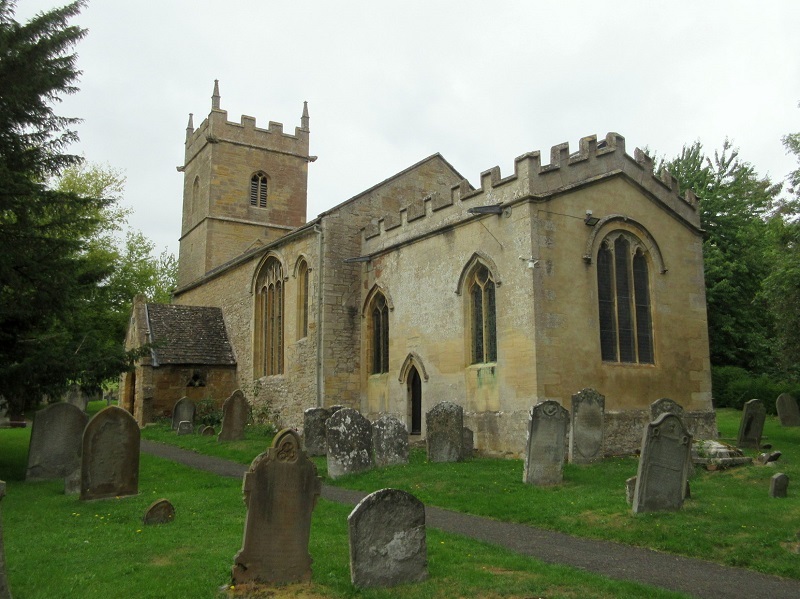 The present church is a rebuilding in Perpendicular style from 1470, its previous incarnation having been dedicated in 1242. The bells are a very pleasing set to ring. Third, 1720 & Tenor, 1734, Abraham Rudhall (Gloucester). 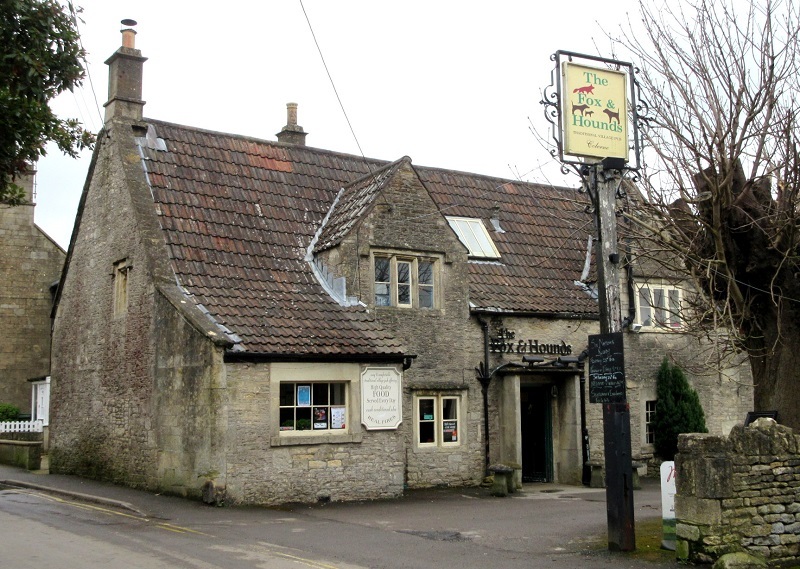 Fifth & Seventh, 1739, Thomas Bilbie (Chew Stoke). Fourth & Sixth, 1888, Llewellins & James (Bristol). Front two bells by Mears & Stainbank, 1910. 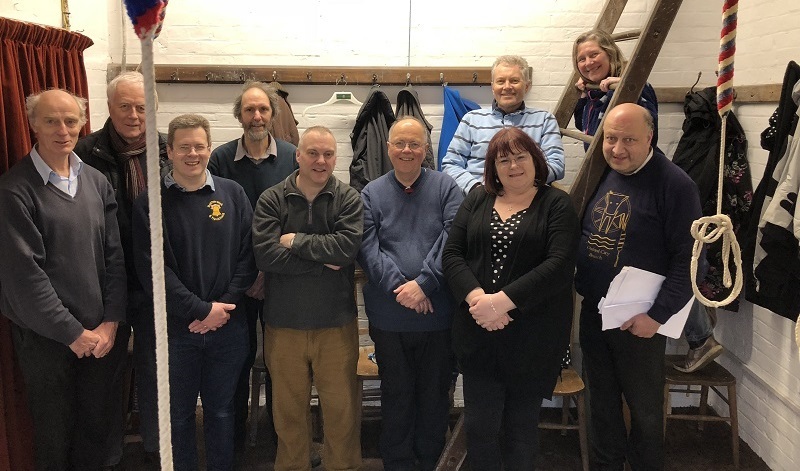 Left to Right: Bob Tregillus, Brian Shacklady, Adrian Nash, Alan Barsby, John Hearn, Michael Probert, Andrew Goldthorpe, Shanie Nash, Alison Merryweather-Clarke & Hugh Deam. Also: Mags Carlyle, Jane Hedges & David Parks. Romsey Abbey of St Mary & St Ethelflaeda see Saturday 29th June 2002 for details. Sherfield English was documented as Sirefelle (clear or divided land) in the Domesday Book, although the manor was first noted during the reign of Edward the Confessor. The manorial affix denotes the L’Engleys family who held the manor here during the 14th century. The manor has been held by several different families of nobility since that time, with Louisa, Lady Ashburton purchasing it in 1903 and providing the funds for the construction of the present church. The red brick central tower is in the 15th century style, with an octagonal stone bell turret topped by a short leaded spire. 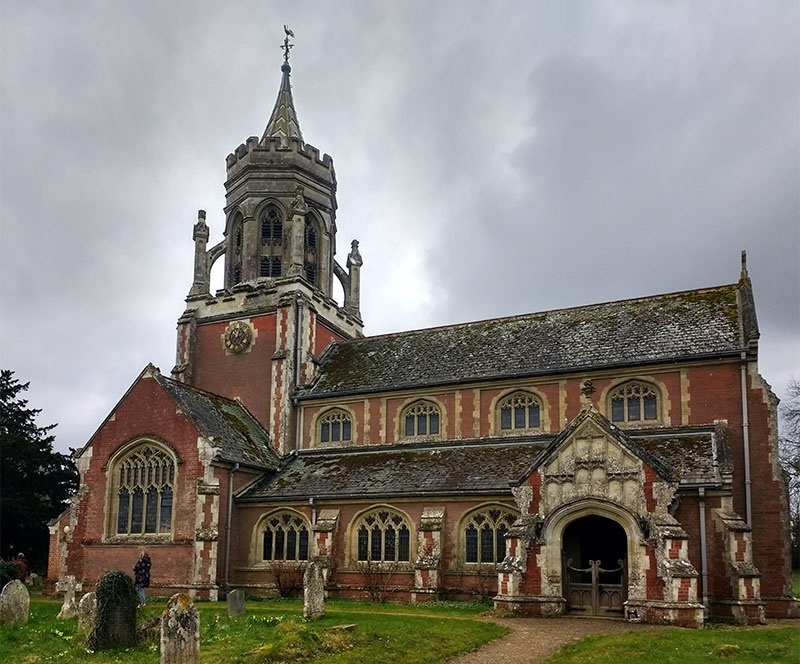 All of the bells date to 1904, cast at the Loughborough foundry by John Taylor & Co. Awbridge (pronounced ay-bridge) was noted in the Domesday Survey as Abedric (Ridge of the Abbots), referring to ownership by St Peter’s Abbey, Winchester. The sporadic village is a collection of hamlets such as Upper and Lower Ratley. All Saints church in the village does not have any bells, but The Clockhouse on Church Road has a set of ten installed within a purpose built garage extension. 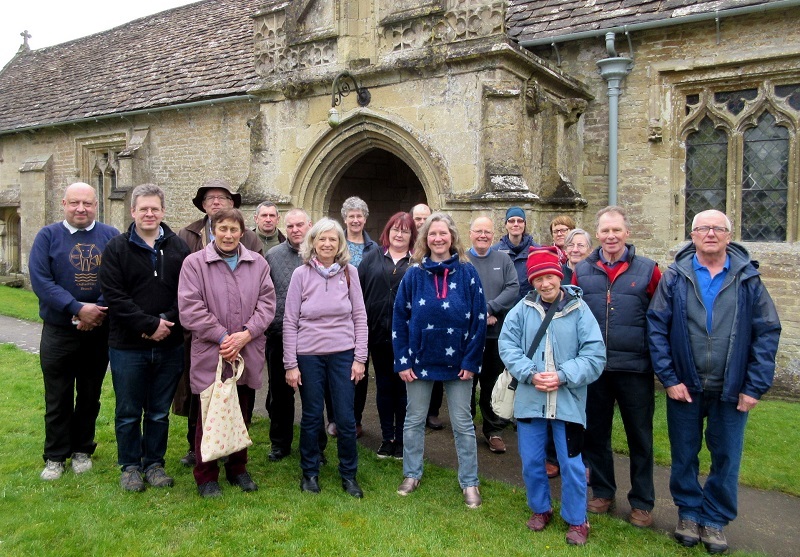 Left to Right: John Pusey, Simon King, Alison Merryweather-Clarke, Steve Everett, Susan King, Elizabeth Mullett, Mike Probert, Andrew Goldthorpe, Colin Taylor, Hugh Deam, Judy Kirby & Paul Lucas. Plain Bob Major, Stedman Triples, Grandsire Triples, Cambridge Minor, St Clements & Single Oxford. Kintbury derives its name from the Anglo Saxon description for the river that it stands upon – today known as the Kennett – and the fortification that once stood here, having its earliest documentation in the 10th century, when it was described as Cynetanbyrig. The village nestles between the Lambourn Downs to the north and the Wessex Downs to the south, having become one of the country’s most sought after places to reside with its numerous transport links. Besides the road, rail and river routes, there is also a long distance path known as the Wayfarers Walk that passes through here. Local legend has it that a tunnel was constructed between the pub and the church for the benefit of smugglers and highwaymen. The parish church is primarily late Norman, with substantial doorways for the north and west entrances. The upper part of the tower has distinctive chequer work, the original upper level having collapsed after a storm during the 15th century. 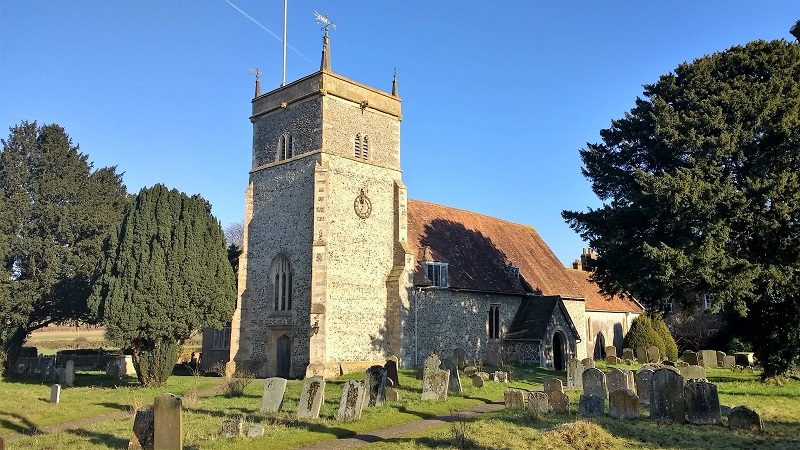 The Kintbury Great Bell was said to have fallen into the river during this event, but it was unable to be retrieved due to a curse from a local witch. 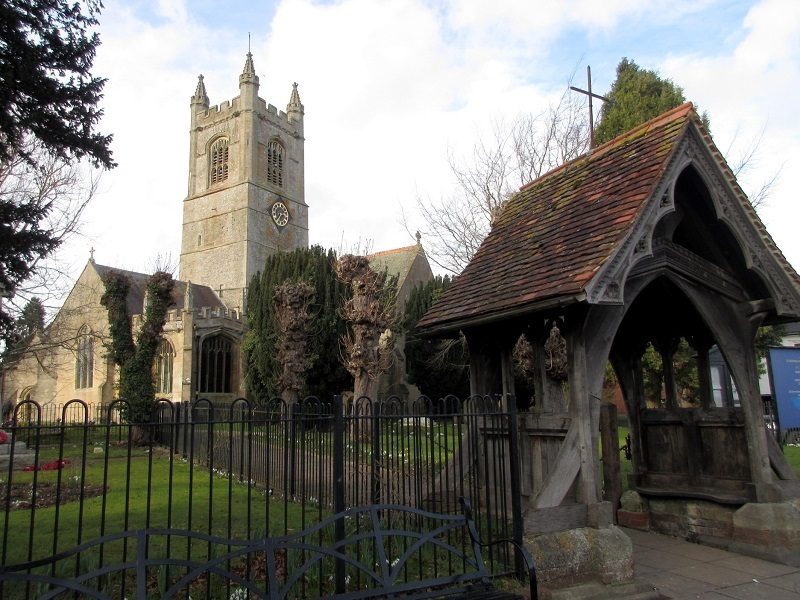 Three of the bells (4, 7 & Tenor) were all cast by Roger Purdue at the Aldbourne foundry between 1629 and 1630. The fifth (1669) and sixth (1576) were both cast by the Knight family at their foundry in Reading. Third, 1702, Robert Cor, Aldbourne. Treble & second added in 1995, Whitechapel. 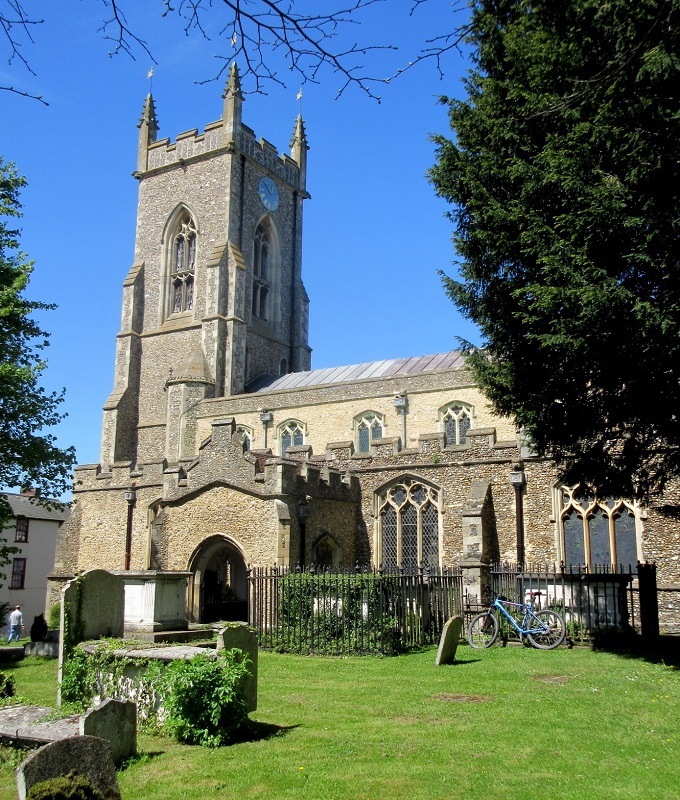 Great Shefford is situated on the B4000, which follows the route of the Roman road known as Ermin Street. The village derives its name from the ford here which aided the sheep drovers, being documented as Schipforda in 1167. 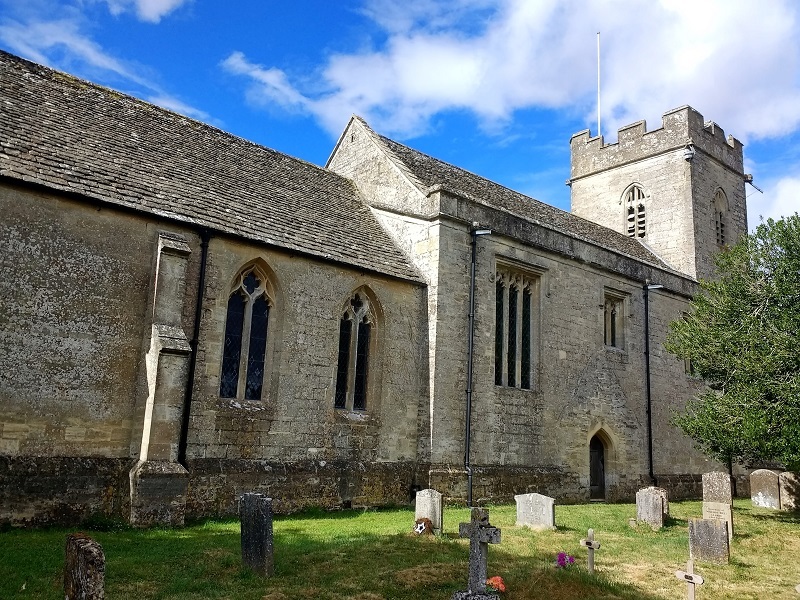 The elegant parish church is situated on the western fringe of the village and overlooks a panorama of archetypal English countryside. Under the tower is a Norman tub-shaped font standing on a plinth with Greek script carved into it, which translates as: Cleanse your sins, not only your face. 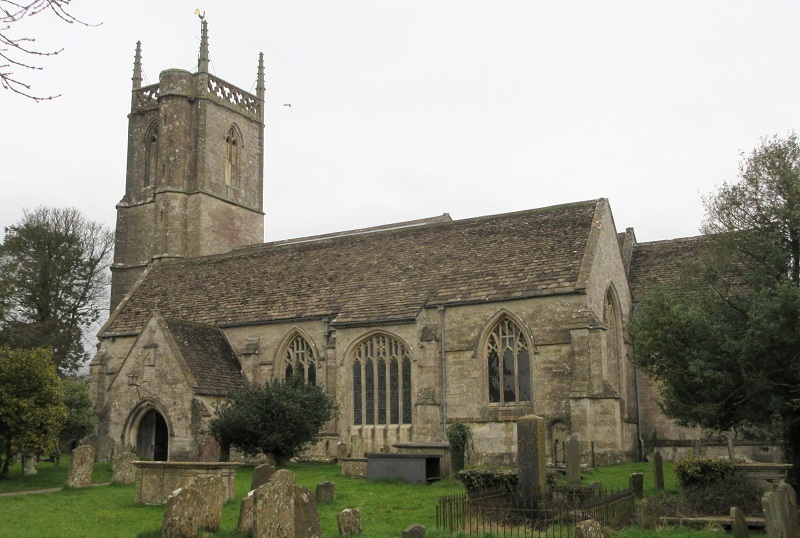 The 13th century tower joins the west wall of the nave, and is one of only two examples of a circular bell tower in the county, although the upper stage is actually octagonal having been added in the 15th century. The bells are hung counter clockwise, with the earliest being the fourth which dates to 1662, William III Purdue, Closworth. The tenor (John & Robert Cor, 1735) and second (Robert Wells, 1781) were both cast at the Aldbourne foundry. The other three bells are all Mears & Stainbank, 1870. 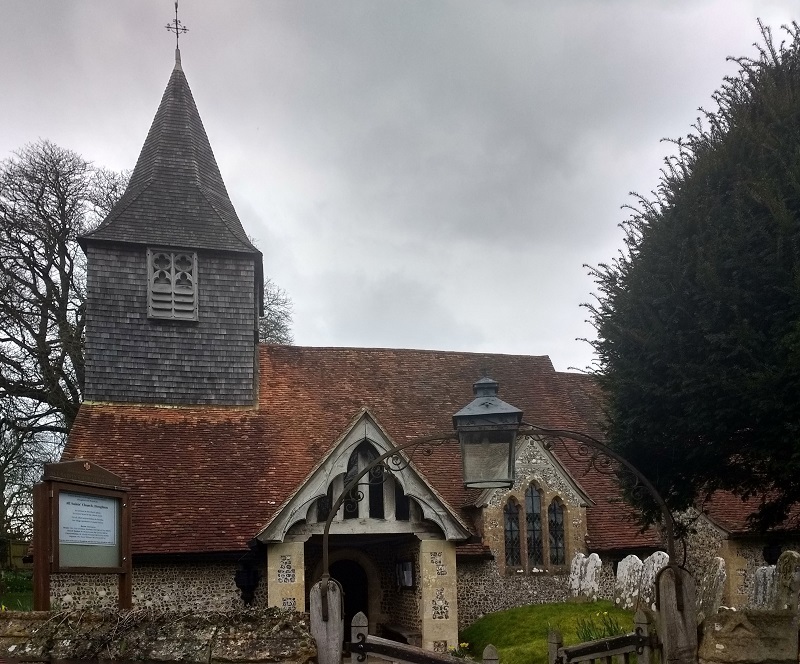 Lambourn is so named from its early history where lambs were washed in the stream that runs through the village, being documented as Lambhurnan late in the 9th century, with reference being made to the importance of this manor to King Alfred. As Newmarket is synonymous as the HQ of English flat racing, so Lambourn is the heart of National Hunt training with its central location in what is known as "The Valley of the Racehorse".